Vaccines are needed to protect dogs and puppies from becoming infected by diseases and viruses, such as parvovirus. My Chihuahua puppies follow a vaccine schedule, once they turn 7 week of age. To view the schedule, scroll down to the bottom of the page. body, and the immune system of the puppy becomes stimulated. that particular disease, then the white blood cells who became expert martial artists will be called upon. Remembering their training and studies, the white blood cells will use their knowledge and effortlessly destroy the disease. Thanks to zeathiel for the photo. Extreme caution must be practiced when administering vaccinations to small puppies. Did you know giving too many vaccines at once, especially to a developing puppy, can cause numerous problems for them? One of those problems is death! Oh my, we should be careful then, to space out the vaccinations we give our puppies, wouldn't you agree? I'm glad you do, because I concur with you and it's exactly why I, and other responsible breeders do. Unfortunately, safe practices like this arn't used by many. There are copious amounts of irresponsible breeders, and even more surprising, veterinarians, who give puppies multiple vaccines simultaneously without worrying about consequences. They may figure, "Well, the disease contained within these vaccinations are so weak, a puppy should be able to handle plenty of them at the same time, right?" Actually no, pretend irresonsible person, you would be wrong. It's very dangerous! Life threatening, even! It's true the diseases are in a crippled state, but the body's immune system still must respond to each of the individual threats. Introducing several threats at the same time confuses the puppy's immune system, hindering its ability to keep up with the huge demand for help the body is now crying for. "I can't be everywhere at once, ahhhh!" - A quote from a stressed out immune system. As the puppy's body struggles to handle the massive invasion, overloading and supression of the immune system become possibilities. Suppressed immune systems are not able to create the appropriate antibodies against the vaccines. That's right, no expert martial artists can be formed! The result is a severly weakened puppy that needs time to recover. However, during the recovery period, the puppy is extra vulnerable to attacks from real diseases! It's these secondary infections that can be deadly. You might be thinking, "well then, I'll just give my puppy a single vaccination! That's safe, right?" The answer is both no and yes. You see, the age of a puppy is the key factor in determining when you should give a vaccine. My Maltipoo puppies and Morkies get their first vaccine around 7 weeks of age. Any earlier, and their immune system might not be ready yet to defend itself from infection. If it's not ready, then just imagine what horrible things may happen! Or better yet, don't, because it's probably bad! At the end of the day, providing vaccines to dogs or puppies is something that requires careful planning. The puppy needs to be old enough, and the body mature enough, to defend itself from the vaccines. Time is also necessary between vaccinations, as it ensures the antibodies have time to be formed. Do you know how to take the appropriate care of a tiny Chihuahua puppy ? If not, why not read my small puppy care guide, where you can learn handy things like how much rest a tiny puppy should have, and what practical commodities you could use to help in their care. Want to know more? Then simply click on the Chihuahua puppy care guide I've created for caring people like yourself. If you are a new owner of a puppy, then I highly suggest you read my feeding instructions. There's helpful tips on how you should feed your small Chihuahua puppy and ways to deal with a puppy that lacks an appetite. You'll also find food supplies listed there, things I feel are vital to have for new owners. My Chihuahua puppies are vaccinated against many diseases by the time they leave my home. Would you like to know more about my vaccine schedule, what vaccines I use, among other fun tidbits? Then go ahead and visit our vaccinations page for important Chihuahua vaccine information. Hypoglycemia in small Chihuahuas and toy breeds is the result of a puppy not eating. A prime reason puppies stop eating is due to the stress they go under when entering a new home. They feel uncomfortable, and that translates to a poor appetite. Do you know what to do to help them? Try enticing your little Chihuahua with delicious Gerber Baby Meatsticks. 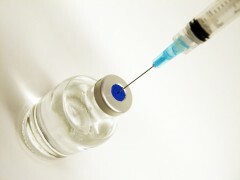 A vaccine! Run for your lives! I have a word of warning I'd like to share to all current dog or puppy owners. You're now aware of the dangers multiple vaccinations can pose to a dog or puppy, so it's time you protect them. How? If you take your dog to a veterinarian on a yearly or bi-yearly basis for booster shots, then keep careful watch on what's happening. Sometimes, a veterinarian may try to give a Rabies shot along with the booster shots. Oh no, that's dangerous; a combination like that could be the end of your poor pet! Intervention on your end will be required here. Safety first! While you are there, check also to see if your veterinarian attempts to give your adult dogs a Corona shot. Why? Corona is a disease only found in puppies, thus, giving it to an adult dog is pointless. This won't stop them from trying though, because they may not be acquainted with that fact. Additionally, watching for this mistake is a great way to gauge the capabilities of your veterinarians intellect in his field of supposed expertise. The sad facts are, despite all the warnings on vaccine safety out there, plenty of veterinarians and irresponsible breeders ignore such advice and instead continue down the dangerous multiple vaccines path. If you love your pet, and I know you do, then use this warning to help protect them. I'm confident that if your dog could talk, they would thank you for it. Or ask for some food. Behold, one of the deadliest diseases a puppy or an adult dog can become infected with. It's known as Canine parvovirus, or parvo for short. It's highly contagious, allowing it to spread from puppy to puppy with ease. If a puppy is not vaccinated against this virus, then you should start panicking right about... now. Don't worry though! I've made sure all of our Chihuahua puppies and our puppies, starting at the age of 7 weeks, are treated with the Neopar vaccine. What's a Neopar, you ask? Neopar is the best preventative vaccine out there against parvo. If you know of other breeders who use this beauitful vaccine in their puppies, then you know one super smart individual! The first signs of parvo is lethargy, or a lack of energy. This is followed by a loss of appetite, vomiting, and diarrhea. A dog's chance of surviving parvo is dependant on their age and how quickly they were diagnosed. If you suspect your puppy or dog has parvo, then rush them to a veterinarian. There is no time to waste! The mortality rate can reach 91%, if left untreated. To avoid these unfortunate circumstances in the future, do yourself a favor and ask the breeder beforehand if their puppies have been treated with the wonderful parvo vaccine known as Neopar. Age 10 to 11 weeks: Four Way Vaccine - Make sure this vaccine does not contain LEPTO, CORONA or GIARDIA vaccines. Age 13 to 14 weeks: Four Way Vaccine - Make sure this vaccine does not contain LEPTO, CORONA or GIARDIA vaccines. Age 17 to 20 weeks: Four Way Vaccine - Make sure this vaccine does not contain LEPTO, CORONA or GIARDIA vaccines. Age 5 months: Kennel Cough Vaccine - Called Bordetella, veteranians will sometimes advise to have this done. Age 6 months: Rabies - You should attempt to hold off on this vaccine until your puppy is over 8 months old.